This and another picture (RCIN 404416) form a pair, much larger than the other twelve views on the Grand Canal, and were engraved as the final two plates of Visentini’s Prospectus Magni Canalis Venetiarum (Venice, 1735), thus providing an uncontested date for completion. Visentini's engravings are based on Canaletto’s series of Grand Canal views which were all at one time in the collection of Joseph Smith and are now in the Royal Collection. The scene depicted is the return to the Molo of the Bucintoro, the ceremonial vessel used only once a year for the Sposalizio del Mar, the Wedding of the Sea, held on Ascension Day and thus otherwise known as the Festa della Sensa. Venice’s principal annual ceremony was of uncertain origin: it commemorated, according to one tradition, the sailing on Ascension Day in the year 1000 of a war fleet to assert Venetian power along the Istrian coast; according to another, the gift of a ring by Pope Alexander III to Doge Sebastiano Ziani - the greatest of Venice’s medieval doges - to sanction Venice’s authority in the Adriatic, in gratitude for Ziani’s support for the Pope against the Holy Roman Emperor, Frederick Barbarossa (Pope and Emperor were reconciled in San Marco on Ascension Day 1177). In the ceremony the Bucintoro was rowed in procession out of the lagoon into the Adriatic, where the Doge cast a ring blessed by the Patriarch into the waters, symbolising the marriage of Venice to the sea. The Bucintoro depicted here was to be the last, constructed in 1728-9 and crowded with gilded wooden allegorical sculptures by Antonio Corradini. After the fall of Venice to Napoleon’s army in 1797, the upper part of the Bucintoro was burnt to recover the gold, after which the Austrians armed the hulk with cannon and placed it to guard the entrance to the lagoon. It was finally broken up in its birthplace, the Arsenale, in 1824. The view is taken from some way out in the Bacino, directly in front of the Zecca, the south façade of which is seen to the left together with the Libreria. Beyond is the Campanile, shortened to fit it into the painting (four small windows serving the staircase running up the shaft should be visible). In the Piazzetta is the marquee of the Ascension Day market, clearly regarded as an integral part of the festival, as Visentini’s engraving after the painting was entitled Bucentaurus et Nundinae (market) Venetae in die Ascensionis, and the overall title of the Prospectus referred only to the market. Beyond are the Torre dell’Orologio and the south flank of San Marco, with the western dome reduced in size and moved eastwards to be largely obscured by the Palazzo Ducale. To the right of the Palazzo Ducale (much diminished in width) are the Prigioni and Palazzo Dandolo (today the Hotel Danieli); moored to the left of the Bucintoro with its oars raised is the fusta, the Doge’s usual single-masted galleon. 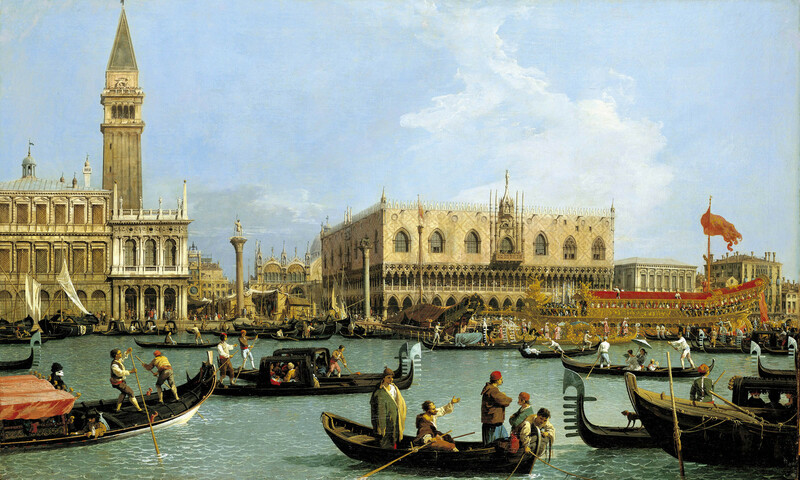 Canaletto probably first depicted the scene in a drawing of 1729, below, and the composition was painted many times by the artist and his followers. This version must have been painted at around the same time as its companion piece.